Eddie Osterland, America's first Master Sommelier, is an internationally acclaimed expert in the culinary arena of food and wine. For more than 25 years, he has performed his workshops and given educational and highly entertaining "during dinner" presentations on Power Entertaining with Food and Wine. SommCon 2015: SommCon hits San Diego with multiple sommelier-level educational tracks devoted to the business of wine. From in-depth regional tastings, beyond the basics theory, certifications, tasting breakouts and study groups, speed-dating style tastings with master sommeliers and masters of wine, and networking with some of the greatest minds in the industry. The first bottle that seriously grabbed my attention was 1966 Feinste Auslese Whelenuhr Sonnenuhr by J.J. Prum. It changed the direction of my life forever! My house red: 2011 Michele Chiarlo Barbara d'Asti "Le Orme"
Unique find: 2008 Àn (100 % Calet) Falanis, 13.5 %, Mallorca, Spain...fabulous food wine! On the road with Eddie O! Eddie Osterland, Author, Speaker and America's first Master Sommelier is an internationally acclaimed expert in the culinary arena of food and wine. For more than 25 years, he has performed his workshops and given educational and highly entertaining "during dinner" presentations on Power Entertaining with Food and Wine. Eddie works as a client relationship consultant specializing in developing high net worth marketing events for new client acquisition. He uses high-end client engagement strategies through luxury marketing events that go way beyond expectations. His clients realize how today, more than ever, you cannot afford to be naïve about food and wines - the international currency for connection. Eddie just published his book Power Entertaining (2013) whose strategies teach executives how to attract money through high-end client engagement strategies. Eddie's educational background evolved from a degree in behavioral psychology to graduating from L'Institut d'oenologie at Université de Bordeaux with the D.U.A.D. degree (diplôme d'aptitude a la dégustation des vins). 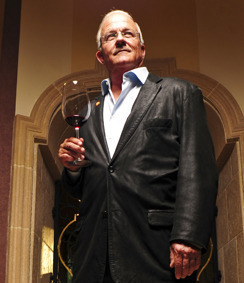 He went on to become the first American to pass the grueling Master Sommelier Diploma in London in 1973. In 1975 Eddie was the head sommelier at Hotel de la Poste in Beaune, France. Upon returning to the United States, Eddie worked as Director of Trade Education at the International Wine Center in New York City. He was the wine editor for Restaurant Business magazine for a decade. Over the course of his career, Eddie has worked with organizations and coached leaders from a wide range of prestigious companies, including Citibank, IBM, Merrill Lynch, HighTower, UBS, Morgan Stanley and National Australian Bank. In 2008 he participated in several major corporate entertaining events at the Beijing Olympics. In 2013 Power Entertaining was published in Chinese.